Explore the best of Madeira on this two week self-guided walking holiday. Discover the beauties of the island: crest hikes, cross the waterfall plateau of Paul da Serra, walk along the Levadas (irrigation canals), and hike through eucalyptus forests. Experienced walkers only - Not suitable for anyone who suffers from vertigo. On arrival at the airport an included taxi transfer takes you to the fishing village of Machico, the first city founded in Madeira on the arrival of Zarco in 1419. After checking in to your hotel you can explore the village, home to the oldest church, the 'Capela dos Milagres', and two forts that still bear witness to the locals' defence against the many pirate attacks of years gone by. The walk today explores the wild Sao Lourenco peninsula at the eastern end of the island, a place where the raging waters of the Atlantic crash up against dark basalt cliffs and screeching gulls wheel overhead in their hundreds There are excellent views towards both the northern and southern sides of the island and, when the weather conditions allow it, across to Porto Santo Island some 60 kilometres away. At the end of the walk a taxi takes you to your hotel for the next two nights in the charming seaside village of Porto da Cruz where you may like to enjoy a swim in the saltwater 'basaltic swimming pool'. Today's 7km walk is expected to take about 3 to 4 hours. Today's walk takes you along the Mimosa Levada to Marocos. It gives you an idea of what life on Madeira was like when there were no roads and following the levada irrigation canals was the only way to get around. For nearly five centuries, this levada served to transfer the 'must' used to make wine between Porto da Cruz and Machico From Canical, you start on a level path hiking along the levada, surrounded by the mimosas that bloom throughout the year. You'll see some 'Palheiros' (the distinctive small 'A'-shaped two-sided houses used as agricultural shelters) that lie scattered on the mountain terraces in the small valleys of Ribeira Secca, Ribeira de Noia and Ribeira Grande. Before reaching the village of Marocos, the landscape becomes more populated and both sides of the levada are bordered by a beautiful array of flowers. Today's 16 km walk is expected to take about 5.5 to 6 hours and you will ascend 240m and descend 400m. Today's walk is one of the most beautiful in the east of Madeira. You can choose to start from sea level at Porto da Cruz or avoid the first 600 metres of ascent by taking a taxi (at your own expense) to Portela. The route starts out on a good path following the Levada do Furado eastwards, passing through lush gardens spread out on the terraces in the valley of Faial. At first, the path is wide then becomes narrower and follows deep ravines through the laurisilva forest, the native marquis-like vegetation which includes trees of heather, bay, cedar and laurel to name just a few species. The mountains of the island dominate the sky high above you. At Ribeiro Frio, you can enjoy the awesome views from the lookout point at Balcoes, looking out over the valley of the Faja de Nogueiras and the great peaks of the island. At the end of the walk it's a short taxi ride to your hotel in Sao Roque do Faial, facing the distinctive rocky mountain of the Pena de Aguia. Today's 11km walk is expected to take about 4 hours (40 minutes less if you take a taxi to avoid the first climb). A taxi will take you to Pico de Ariero (1818m), the starting point of today's hike. The trail undulates along through some very impressive gullies between Ariero and the Pico de Gato that you will cross by a small tunnel. The views to the east side of the island are incredible. A beautiful section Of the path follows a 'balcony' passing under the Torres to a point below the summit of Pico Ruivo. The final section of the climb ascends through the heather trees to Pico Ruivo (1862m) the panoramic summit. From here, part of the descent is back on the same route then continues to the road head at Achada de Texeira. Here a taxi transfer will take you to Santana, the largest settlement on Madeira's northern coast. Today's 10 km walk is expected to take about 4 to 4.5 hours and you will ascend 550m and descend 700m. A taxi takes you to Quemaidas, a green and luxuriant park which is where todays walk starts. The wide path is surrounded by spruces which is unusual for Madeira. This former levada runs along the northern flanks of the high peaks. The path becomes narrower as you walk along the levada; offering amazing views over one of the wildest valleys of the island. After hiking through a few short tunnels you arrive at Caldeirao Verde. A truly spectacular sight, the waterfall which is about 100 meters high flows into the characteristic 'green caldron'. From here you trek back to Santana, firstly descending to Sao Jorge by the Lapa valley which offers great views over the landscape dotted with villages. Today's 14 Km walk is expected to take about 5 hours and you will ascend 80m and descend 600m. Today's walk from Achada de Texeira to Encumeada opens up some of the most beautiful landscapes of the island. The crest path that you follow is surrounded by heather trees and at points opens up to stunning panoramic views of the northern and southern coasts. You will walk up and down some sections of large paved steps along this amazing way. At the Torrinhas pass, you take the path to Curral da Freias and Boaventura then continue to the Pico da Jorge. Following the path leads to the pass of Encumeada (1004m), overlooked by the Paul da Serra plateau and some gigantic wind turbines. On most days a fascinating display of clouds can be seen arriving from the north and curling their way down the southern slopes. Today's 18 Km walk is expected to take about 6.5 hours and you will ascend 500m and descend 1100m. Attention! This hike for good to very good walkers can be replaced by a rest day with a taxi transfer from Santana to Encumeada along the great northern coast (the transfer is not included). Today you have the pleasure of walking along a levada of flowers, where hydrangeas, agapanthus, lilies, azaleas, conifers and laurels enhance the walk. The views over the Sao Vicente valley are beautiful, interspersed with a few tunnels that lead to the extraordinary cove at Folhadal. It's a basaltic cove, submerged by vegetation with endemic species like the lily of the valley and the native laurisilva; a wonderful forest with wild laurels and giant ferns. The waterfalls flow from one cove to another, giving this place a very wild aspect. The levada then continues to the pass of Encumeada and then down to your hotel. Today's 10 Km walk is expected to take about 3 to 4 hours and you will ascend 250m and descend 250m. Today's path goes up along the Fenda do Ferreiro and continues under the crest of Pico Grande (1600m) along a large cliff wall of black basalt. The panoramas over the valley of Serra de Agua and Paul da Serra to the pass of Boca do Cerro are wonderful. From here, you see the astonishing valley of Curral das Freiras (valley of nuns) in the centre of the island, dotted with traditional Palheiros, some with characteristic thatched roofs. In the distance, the chain of the Great Peaks stands proudly. The trail ends at the road at Boca de Corrida. From here it is a short taxi ride to Jardim do Mar where you will spend the next two nights. Today's 14 Km walk is expected to take about 6 hours and you will ascend 550m and descend 100m. Today starts with a taxi ride to the Levada of Nova where an easy walk will take you to the heights of Prazeres and its small village. It's one of the flattest villages on the island, in a wonderful setting and a designated UNESCO World Heritage Site. The descent starts with a great view over the Atlantic, taking a stunning path that ends in a volcanic fault and leads to the attractive fishing village of Paul do Mar. The abrupt and multi-coloured volcanic rock walls give this descent an extraordinary dimension. A short taxi takes you back to Jardim do Mar for the night. Today's 14 Km walk is expected to take about 5 to 6 hours and you will ascend 600m and descend 600m. Today is a good opportunity to take a rest from walking and enjoy the scenic drive along the remote northern coast. Once you have arrived at the charming town of Porto Moniz, check in to your hotel and enjoy the afternoon relaxing; the natural swimming pool in Porto Moniz is possibly the most beautiful place to swim on the island. It's also one of the nicest villages in Madeira and well worth exploring the Fort Sao Joao, the church and Main Square. With your walking boots back on and feeling refreshed you start today on the Paul da Serra plateau. At the Fonte da Bispo, a wide path will take you to the wildest valley of the island: Ribeira de Janela (about 2 hours of descent). This is one of the most beautiful levadas of Madeira. After a short walk to see its source you then take the surrounding path which has a few easy tunnels livening up the walk. This well protected levada is one of the most peaceful and panoramic on the island. You will walk along the levada surrounded by hydrangeas, apple and fig trees, offering splendid views of the western slide of the valley and its cultivated terraces. Return by foot over the village and the narrow streets with beautiful views over the ocean. Today's 18 Km walk is expected to take about 6 to 7 hours and you will descend 1200m. Attention! This hike is for good walkers, it can be replaced by a rest day with only the Ribeira de Janela return walk (no difference in altitude). Today's walk is in the heart of the 'Emerald Mountains'. Three levadas emerge from this stunning landscape, some of the most beautiful of the island. You will start by the Levada do Risco, an easy walk on a wide path surrounded by ancient trees. Reaching Risco you will see the magnificent waterfall cascading from a height of a hundred metres, surrounded by lush vegetation. A little further on you will join the levada of '25 fontes' (25 sources). From there, you descend to the third of the day's levadas with its mossy waterfalls. Cross the river to climb up to the House of Rabacal. From here a taxi takes you by the Paul da Serra plateau to Funchal with a stop in Cabo Girao, the highest cliff over the Madeiran Sea (600m). Your last night in Madeira is spent in the lively island capital Funchal. Today's 5 Km walk is expected to take about 4.5 hours and you will ascend 250m and descend 250m. The following are essential: good quality waterproof jacket and trousers, fleece jacket, comfortable walking trousers, shorts, warm hat and gloves, sunhat and sunglasses. A luggage transfer between each accommodation. This is provided by a local taxi supplier. Bring a water bottle (preferably 2 litres) and high factor sun cream. Trekking poles are recommended. Tap water is safe to drink as are the fountains found in villages, but water sources along the trail may not always be drinkable. Using tap or purified water rather than bottled water will help avoid creating plastic bottle waste. Energy snacks including chocolate and sweets are recommended whilst on trek. 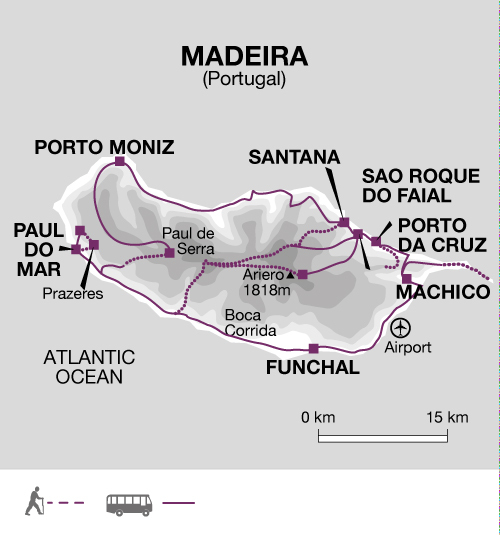 For this trip you can fly into and back from Funchal airport. Funchal is served by both budget airlines (EasyJet from Gatwick) and non-budget airlines (including British Airways and TAP). For this trip you can fly into and back from Funchal airport. 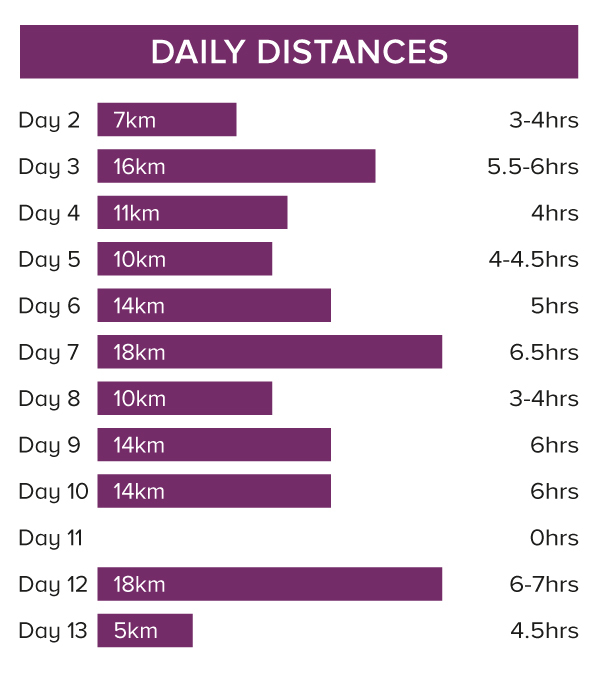 On this trip you will walk 137 km over 11 days (an average of 12.5 km per day). Walking is generally on well-marked paths and dirt tracks, there are some road sections. Parts of the 'balcony walk' on day 5 are not suitable for vertigo sufferers. We have graded the walking on this trip as Moderate. Fri 1 Mar 2019 - Sun 30 Jun 2019 Your trip can depart anytime between the above dates. Contact us for triple room requests and solo traveller prices. Mon 1 Jul 2019 - Sat 31 Aug 2019 Your trip can depart anytime between the above dates. Contact us for triple room requests and solo traveller prices. Sun 1 Sep 2019 - Thu 31 Oct 2019 Your trip can depart anytime between the above dates. Contact us for triple room requests and solo traveller prices. Fri 1 Nov 2019 - Tue 5 Nov 2019 Your trip can depart anytime between the above dates. Contact us for triple room requests and solo traveller prices. Wed 6 Nov 2019 - Mon 16 Dec 2019 Your trip can depart anytime between the above dates. Contact us for triple room requests and solo traveller prices. Tue 17 Dec 2019 - Tue 31 Dec 2019 Your trip can depart anytime between the above dates. Contact us for triple room requests and solo traveller prices.